Skating is free and open to the public, with skate rentals available for $12. CHICAGO (WLS) -- The outdoor skating rink at Millennium Park is scheduled to open Nov. 13. The public can hit the ice after an 11 a.m. opening ceremony that will feature skaters from Ice Ranch, a non-profit dedicated to promoting participating in ice sports. 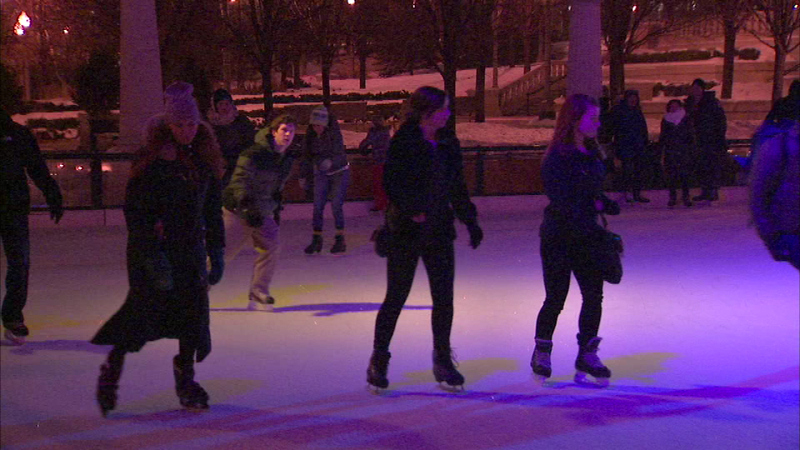 For more than a decade, the ice rink has become a Chicago winter tradition drawing over 100,000 skaters annually. Winter Workouts will be held free skating lessons on Fridays-Sundays, one hour before the rink opens. Additionally, lessons and special programming (including speed skating demos, Noodle Hockey and ice dance demos) will be offered during Chicago Public School's Winter Break, December 21 - December 31, one hour before the rink opens, except on December 25. The McCormick Tribune Ice Rink is located in Millennium Park on Michigan Avenue between Washington and Madison Streets. - Thanksgiving, Thursday, Nov. 26, 10 a.m.-4 p.m.
- Friday, Nov. 27, 10 a.m.-10 p.m.
- Martin Luther King Jr. Day, Monday, Jan. 18, 10 a.m.-8 p.m.
- President's Day, Monday, Feb. 15, 10 a.m.-8 p.m. The ice rink will stay open until March 6.